It all started in the early eighties when Dennis Royer, president and founder of Royer Homes Ltd., saw a need for more customized options for homebuyers. As a skilled craftsman, he enjoyed the success of several renovation projects. Becoming a custom homebuilder was a natural progression that enabled him to demonstrate his commitment to excellence. Now, with over 20 years experience as a general contractor, Denis has earned a solid reputation for building quality custom homes at an affordable price. 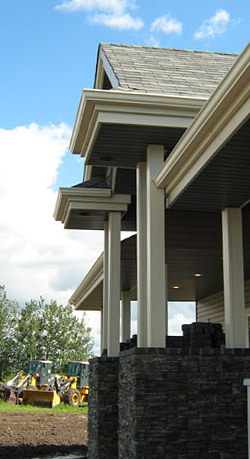 At Royer Homes, our philosophy is that great companies are a direct reflection of the people running them. In an age where few business owners dare to place their name on their product, Denis Royer has continually advertised his name on the homes he has built. Denis started the company as D. J. Royer Contracting in the early eighties and is now operating as Royer Homes Ltd.